Our CVE initiative helps us to clearly understand what customer's value, agree on what needs to be accomplished to improve our competitive value proposition, and align our people, processes & technology around the initiatives that will deliver the best value in the marketplace. The entire organization at OneAPPS - Service Delivery, Finance, Operations, Human resources, and especially customer service - all functions and departments that impact the customer directly or indirectly, are aligned to the CVE model. 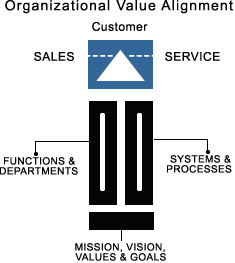 The model illustrates how we can maximize customer value by keeping the customer at the top. We believe in, "it is because of the customer we are here, without customers we don't have any reason to exist". Continuous improvement, customer delight and building loyalty are the prime focus areas of our service delivery model. We understand that improvement requires commitment, facing one's shortcomings and having the data to measure ones progress vs. the best in the industry.